Janine was always a little nervous eating around me when we first started dating. It didn’t matter if we were dining at a swanky restaurant or having a simple meal at home. She would display proper table manners at all times. 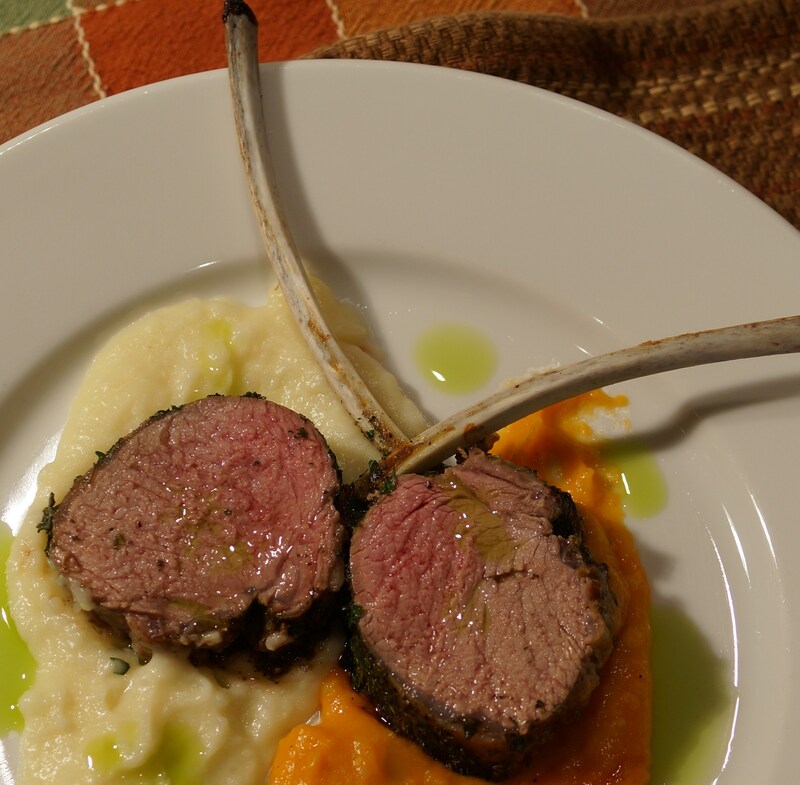 The first time we ate rack of lamb proved to be a defining moment. Janine began by carefully trimming the fat from each chop and then cutting herself one small bite at a time. My initial thought was to lop off great hunks of meat and wolf them down in a primal feeding frenzy. After much deliberation, I opted to follow Janine’s lead and eat like a civilized human being. The last thing I wanted to do was scare her off. I guess I was also a little nervous eating around her. The meal progressed with dignity and refinement. Conversation would have to wait until we carefully chewed and swallowed each bite. We were a picture of perfect dining etiquette. When dinner was over, nothing but rib bones remained on our plates. The only morsels of food left were the succulent little nubs of meat that connected the bones to the tender spring lamb chops. Each bone had a couple of bites left but they were too small to cut off with a knife. A fleeting look of disappointment came over Janine’s face when she realized these little morsels would go to waste. At that instant, I realized what would make her happy. Grabbing a rib bone from my plate, I raised it to my mouth and began gnawing on the meaty end. Janine followed my lead and we proceeded to pick the bones clean. I’m pretty sure that was the last time we were nervous eating around each other. Place carrots in a medium sauce pan. Add enough water to just barely cover the top of the carrots. Add rice, butter and salt. Cover cooking liquid with a parchment paper lid (see “Cooking Tips” section for instructions on making lid). Place pan over medium low heat on top of the stove. Simmer until most of the water has evaporated. Transfer contents of pan to blender and process until smooth. Return mixture to pan. Heat puree over low heat. Stir in cream and brown sugar. Add salt to taste. 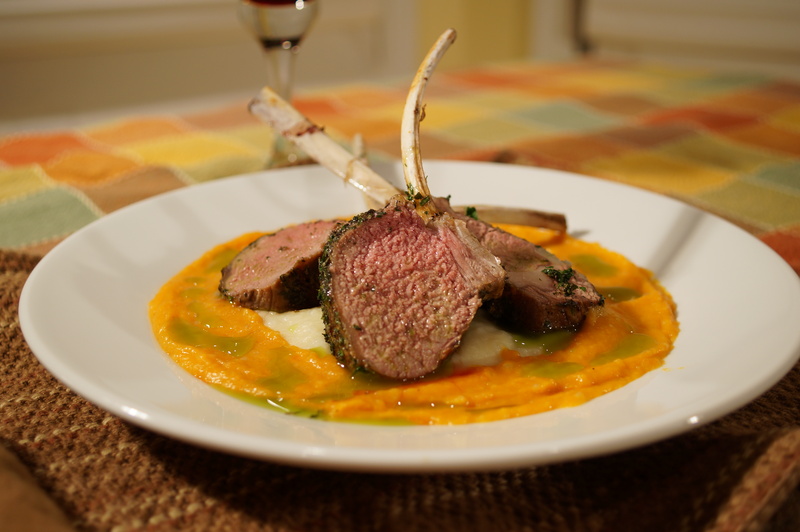 Keep puree warm until lamb is ready to serve. Place parsnips in a medium sauce pan. Add enough water to just barely cover the top of the parsnips. Add rice, butter and salt. Cover cooking liquid with a parchment paper lid (see “Cooking Tips” section for instructions on making lid). Place pan over medium low heat on top of the stove. Simmer until most of the water has evaporated. Transfer contents of pan to blender and process until smooth. Return mixture to pan. Heat puree over low heat. Stir in cream. Add salt to taste. Keep puree warm until lamb is ready to serve. Preheat oven to 350 degrees. Season each rack with salt and pepper. Heat oil in large frying pan until it begins to smoke. Add lamb and butter to pan. Sear on all sides. Tilt the pan over the flame so melted butter pools on one side. Spoon melted butter over the top of the racks while they cook. Remove racks from pan when a light caramelized crust has been formed on the outer surface. Dilute mustard with water. Using a pastry brush, coat racks lightly with mustard. Sprinkle herbs evenly over racks. Set racks on a roasting pan and place in oven. Roast until a meat thermometer inserted into the thickest portion of the rack reads 145 degrees. Remove racks from oven and let rest for 10 minutes before slicing. Serve with pureed carrot and parsnips. Perfectly beautiful! Thank you for the recipe… it is my household’s favorite. 😀 Fae. Thanks Fae! We appreciate it. BTW – We enjoyed the travel posts on your blog. What a sweet story! And beautiful lamb! Thank you for the kind words. We appreciate you vsiting our blog.